Review copy provided by Enchanted Book Promotions in exchange for an honest review. Grape can’t unlearn what living in Sortilege Falls has taught her. Magic is real. Vampires live among us. And there’s a portal in her back yard that leads to another world. A few weeks ago, Grape lived a quiet life with her family in Watts Landing. Now, she’s stuck in Sortilege Falls, searching for a way to rescue her brother from the other side of the rift. She’s connected to Brad through dreams and what she sees terrifies her. Brad is being tortured into performing magic and, even worse, he’s being forced to torture others. Grape hounds the magic folk in town, seeking a way through the rift. Her mother’s memory’s been stolen. Her new vampire friend refuses to help. Grape must do it all alone. What she uncovers is a whole host of secrets about the town and her own family. And she’s not the only one hunting for answers. Time is running out for Brad, but it might be running out for Grape as well. 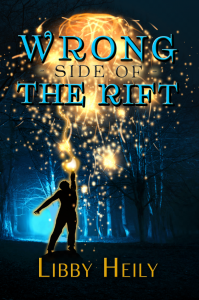 Wrong Side of the Rift is the second book in a series about Grape Merriweather, the main character. I didn’t read the first book, Welcome to Sortilege Falls, before picking up the sequel, but I could follow along just fine. Although I would recommend starting with the first book since you do probably miss some background story by starting with the sequel, it’s not necessary. Anyway, on to the book itself. Grape knows magic and vampires are real, and that there’s a portal in her backyard that can transport her to another world. But not everything is magical and fun in Grape’s life. Her brother has been kidnapped, and if she wants to save him, she’ll have to find a way through the rift. But while doing so, she uncovers more secrets than she thought possible…and not just about the town, but her own family as well. This book really kept me on the edge of my seat. The world-building was great, not too complex, but easy enough that you could just dive right in and adapt to the rules of Grape’s world. Grape is an interesting character, and I loved her sometimes quirky personality. I couldn’t wait to find out what happened next, and had to finish this book in one sitting. Thank you for the nice review!